Deep in the Cambridgeshire fens is an old house by the name of Ninepins where lives Laura with her 12 years old asthmatic daughter, Beth. Laura rents out the pump house, once a fen drainage station to students every year to earn a little extra income. But this year she lets it to a girl named Willow on the recommendation of her social worker, Vince. Willow has a dubious past. Her childhood has been particularly disturbed as her mother, a hippy, had since been suffering from some bi polar disorder. On top of it, Beth who is entering her teens, is falling in the company of wrong girls and has been facing problems at school. She asserts that she is old enough to make her own decisions and seeks no interference in her matters from her mother. The once peaceful life of Laura is crumbling down and she does all she call to keep it intact. How will Willow and her past influence Laura and Beth's life? How will Laura handle her daughter's demand for independence? There is also some sprinkling of romance in the story but that is always in the sidelines. The story revolves mostly around the 3 female characters as they try to straighten out their lives from a tangle of problems caused by emotions, surroundings and company. This is the second book I have read of the author and I have realized that characters and landscape play a very important role in her novels. In her previous novel, The Tapestry of Love she brought the French country side vivid in your mind and in this novel you could get a picture of the atmosphere in the Cambridgeshire fens. The beauty of her novels also lies in the well sketched and entirely believable characters. As you read the story you can connect with each characters and empathize with them. I loved Laura's character and could understand her desire to protect her child as she is going a difficult period of age. I could empathize with Willow for all the problems she had faced as a child. All the emotions are heightened by the intricate details of the landscape the story is set in. Above all the author is very meticulous about the treatment of all the relationship portrayed in the story. The tone of the book is gentle yet assertive. But the best part is that the narration is entirely non judgmental. It doesn't judge things and situations as right or wrong, but shows how life takes unexpected turns much to our discomfort. There is even an element of suspense and mystery that makes it an even more compelling and enjoyable read. 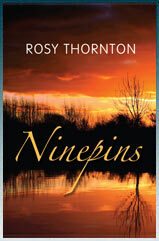 In a nutshell, Rosy Thornton latest novel, Ninepins explores the dynamics of relationship between a mother and a teenage daughter, complicated by the arrival of a stranger with a troubled past. Overall, a very good read. A story about love and relationships. It asserts the belief that love alone goes a long way in mending relationship, keeping them intact and bringing harmony in life.